Put together by 3DFuture, these renders depict a much-improved C-series iPhone with a fingerprint scanner, a larger display, and Apple’s latest iSight camera. It’s essentially an iPhone 6 with a colorful polycarbonate shell, and it’s absolutely gorgeous. If Apple was to resurrect its plastic iPhone, there’s a good chance the iPhone 6c would look a lot like this, though I suspect Apple would swap the colorful accent around the Touch ID sensor for a more subtle black ring. And if it’s going to be thicker than the original aluminum model, I’d want that rear-facing camera to be flush against the casing, too. 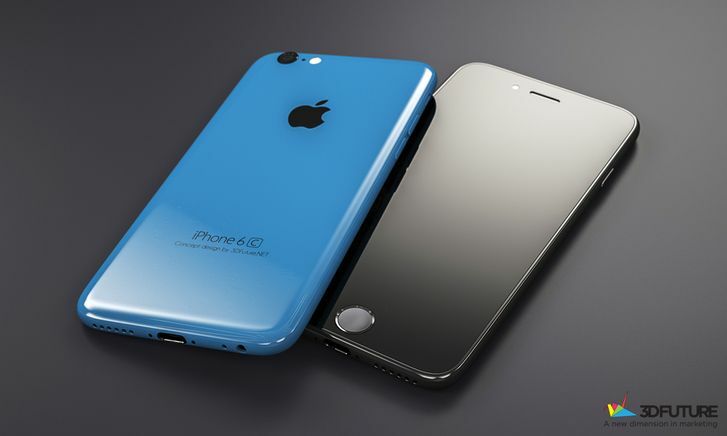 If the iPhone 6c was to be based on the previous year’s iPhones internally, as the iPhone 5c was, we could expect it to have a 4.7-inch Retina HD display, Apple’s 64-bit A8 processor, and an 8-megapixel camera. But again, it’s probably not going to happen. Apple’s decision to use older specifications and cheaper materials for the iPhone 5c and then make it just $100 cheaper than the flagship iPhone 5s meant it was destined to flop from the start, and the company didn’t sell anywhere near as many units as anticipated. However, the iPhone 5c is still available to purchase, so perhaps the C-series isn’t totally dead just yet.